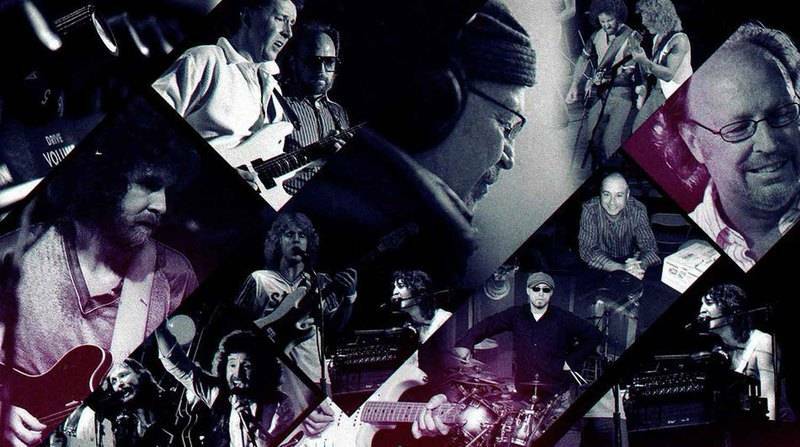 Dakota is a US based melodic rock group active during the late 1970s and early 1980s, not to be confused with the British pop-rock band of the same name active from 2007–2010. 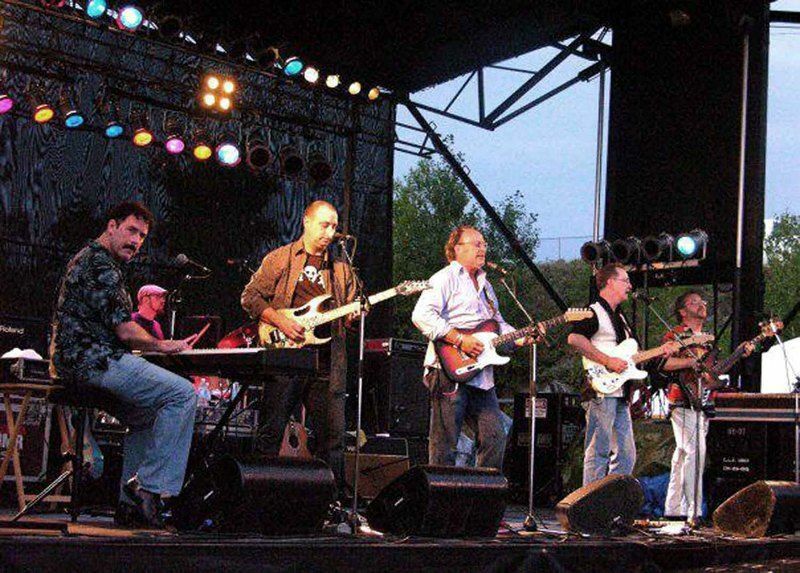 Dakota first achieved moderate success with their 1979 self-titled album Dakota,but the band's popularity increased rapidly while performing as the opening act for Queen on their 1980–1981 The Game Tour.The band released their second and best-selling AOR album, titled Runaway, in 1984.The band experienced several line-up changes during the 1980s and eventually stopped performing in 1987.During the 1990s and 2000s original member Jerry Hludzik continued to record a number of records under the Dakota name, featuring guest musicians, friends and also his son Eli Hludzik. In 2014, original members Jerry Hludzik and Bill Kelly reunited and teamed up with Jon Lorance and Eli Hludzik to record a new Dakota album titled Long Road Home, which is set for release on September 30th, 2015. A milestone in AOR history, DAKOTA's "Runaway" is a must have into any collection.Yeah, it was reissued this year alongside the other Dakota 2016 albums already featured in this blog here a couple weeks ago, but the one to get is this Rock Candy remastered CD which truly makes justice to the sound of this incredible masterpiece for the genre.Founded by vocalists / guitarists Jerry Hludzik and Bill Kelly, DAKOTA had their roots in the '70s as ex members of The Buoys and Jerry/Kelly Band, before signing to Columbia and releasing their eponymous debut in 1980.In 1984 Dakota released this, their 2nd album "Runaway", now regarded as an '80s AOR milestone. 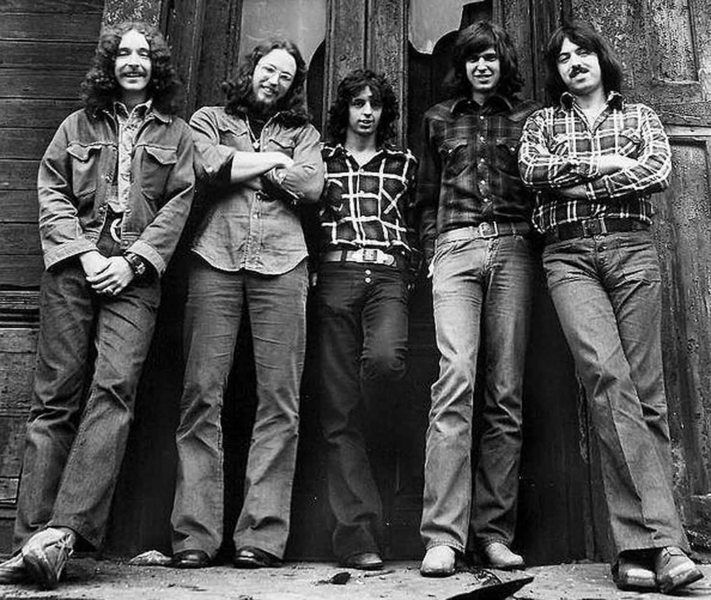 Recorded in Los Angeles and produced by Chicago drummer Danny Seraphine, the album contains nine of the most celebrated AOR / Melodic Rock tracks ever recorded.It is the songwriting of Hludzik and Kelly that makes an immediate impact; laced with copious melody, huge hooks and musical support from a long list of the best L.A. Session cats.You will recognize all the players that were involved in this album such as Paul Jackson JR, Steve Porcaro, Richie Zito, Neil Steubenhaus and Bill Champlin to name few.The sound is a fine blend of Pomp rock, catchy Melodic Rock and sumptuous AOR, with touches of Trillion, Styx, Peter Frampton and Toto.Superb melodies with stylized layered harmonies, twin guitars balanced with two keyboard players, and solid bass and drums that provide a dynamic rhythm.The album opens up with the classic tune "Runaway". This is a perfect AOR-song that has everything from big hooklines, fluffy keyboards and harmony vocals. Pure ecstasy. "Heroes" is a lovely mid-tempo song with great piano / keyboards in the background through the whole song. In some moments it sounds very much like Meat Loaf going AOR. "Into The Night" goes in the same style as "Runaway". The sound is huge and filled with awesome hooklines ala Survivor. Bill Kelly sings like a God on this one and the harmony / background vocals are fantastic. "Angry Men" starts off slow with Bill sounding like David Brickle but turns out to a rocker in the chorus. 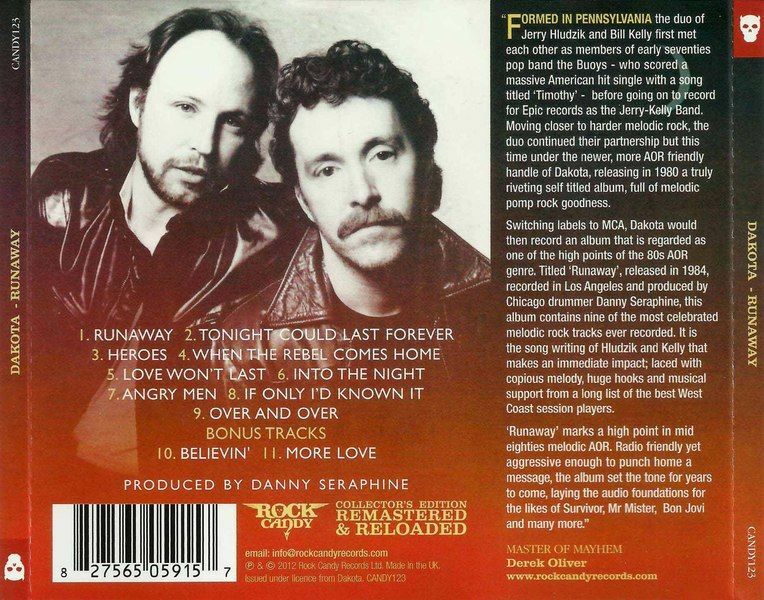 The whole song smells Survivor for a long way and I'm sure that Peterik & Sullivan would have loved to have this song on the 'Vital Signs' album.The guitar / keyboard interplay stands out on "When The Rebel Comes Home", then "Love Won't Easy" is another big, monster AOR song, and "If Only I'd Known It" is more of a ballad, with a delicious melodic guitar solo.This 24-bit Rock Candy remastering from original source tapes is just awesome.Not only the sound is terrific, the reissue includes two excellent bonus tracks as well; "Believin`" is a straigh ahead AOR-rocker with lovely keyboards and a killer chorus with great background vocals. 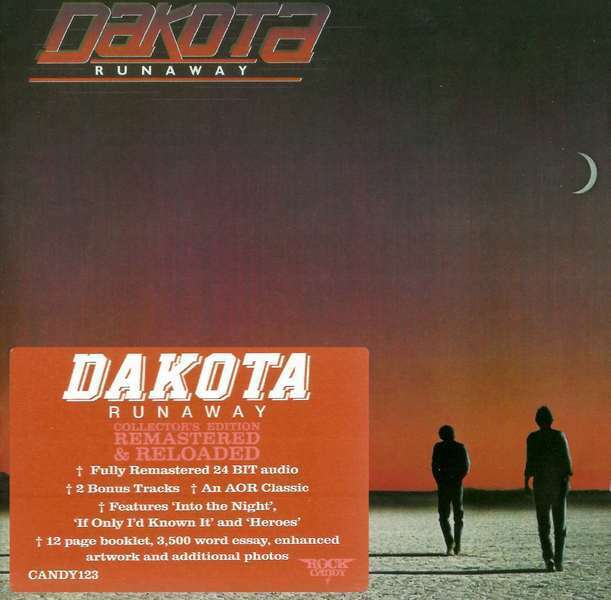 "More Love" sounds kinda like a Franke & The Knockouts tune, very '80s radio friendly.Dakota's "Runaway" is an AOR masterpiece that should belong to any AOR collection, indeed any music collection in general. Bill Champlin - backing vocals on "Angry Men"
Ernie Watts - saxophone on "Over And Over"
Návrat na "NOVINKY 2012 / NEWS 2012"